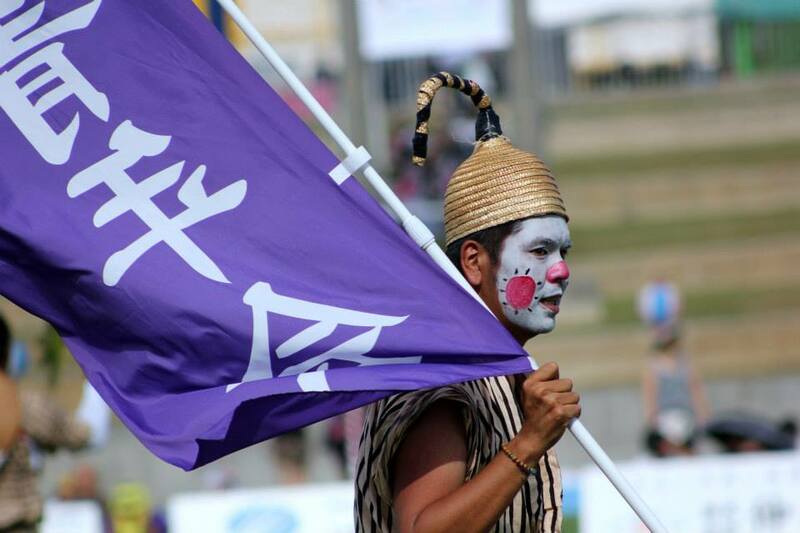 It’s the end of summer, and the Okinawans are bidding sayonara to the Summer in style. But it’s not all that. 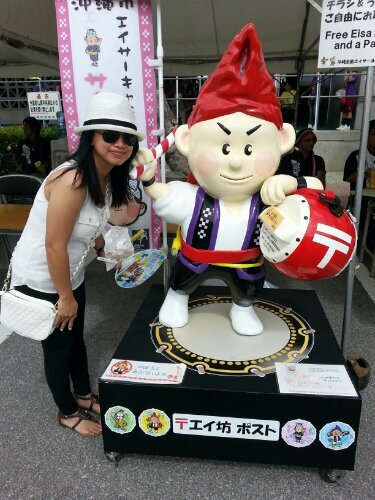 It also marks the end of Obon Festival, which pretty much the equivalent of the Day of the Dead. Thus, it is also a farewell to their ancestors. American celebrates it as Halloween. Chinese has Ghost Festival. Philippines is the same way where they visit their departed family member’s grave, clean and honor it. 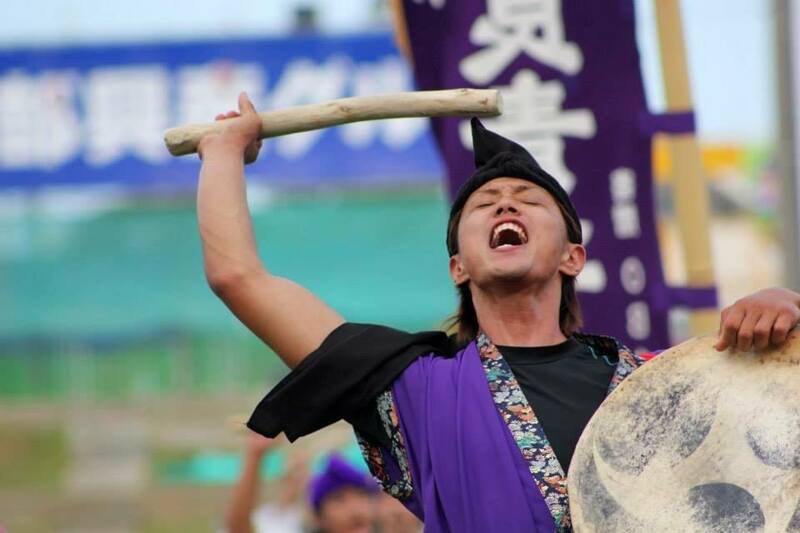 Well the deal with Okinawa, Japan particularly is that they celebrate a kind of continuation of the Day of Dead with Eisa Festival in a festive, loud, artful, and very lively way… unlike any other. 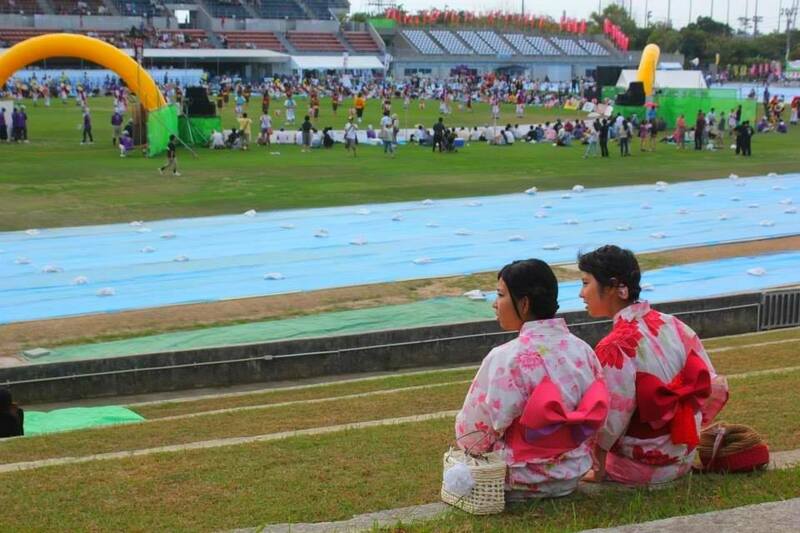 The costumes are not entirely Japanese but of traditional to Okinawa. 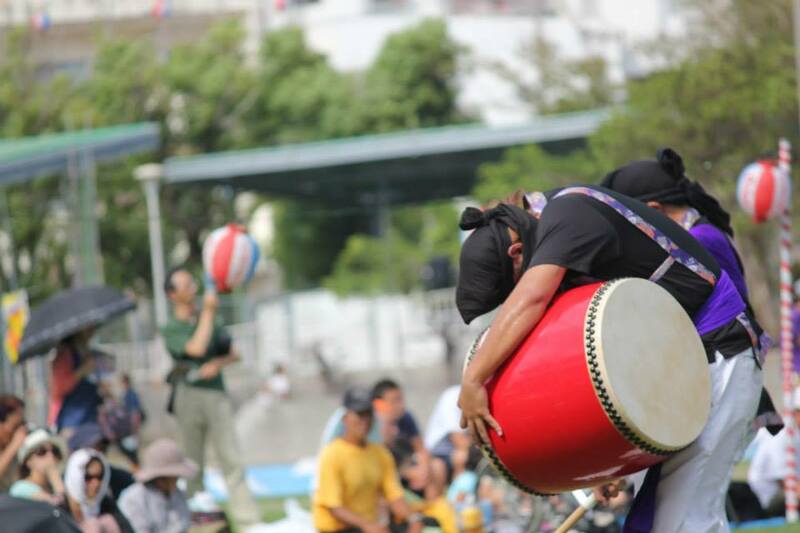 The drums are called taiko, or shimedaiko or paaranku. 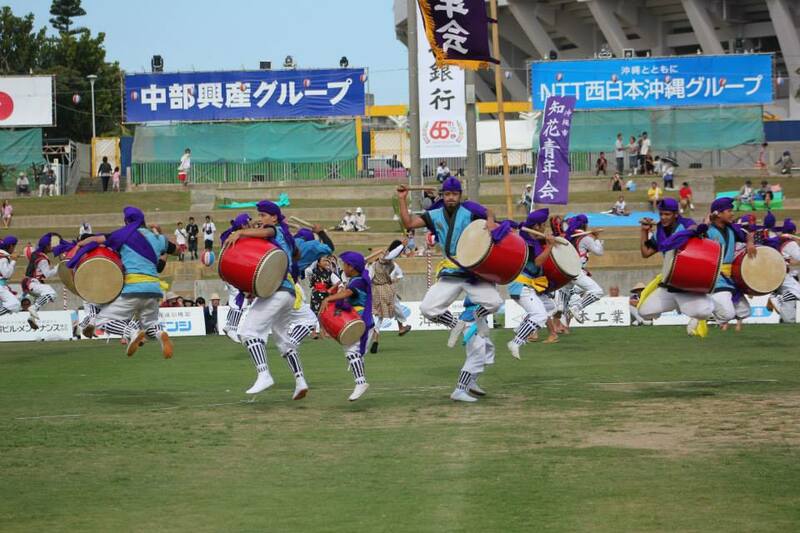 The dance, the beating of the drums and the music are creative, meaningful, and also competitive between cities. Those two above, the one with the flag and the whistler, are always there. Below, to your left is one of the two of the festival’s icons. I’m so proud of my jump shots. I really love the jump shots. Here’s the group. Come check out my EVENTS posts. you also an see my event posts all September back to my homepage. Actually, it is scorching hot in herrrre in the summer. I had to adjust so much to the humidity and mugginess of the weather here. Though today, it rains a lot, and we are anticipating more throughout the week. Thanks for the feedback and visit, Elle. Have a great one to your end of the globe. By the way, you need to fix your gravatar in a way that when people click your name they can go directly to your blog. Yours doesnt do that. Gremlins again! I fixed that about 6 months ago (at least I thought I did) and never thought to check it again after testing it immediately after. thank you so much for letting me know. Time for bed here now, but I will sort it in the morning. Thanks again. I dont exactly know what powwows are. But thanks for the good word. My travel buddy will appreciate the comment. Love the jump shots! Great work! Yeah, it’s very interesting how different cultures have different ways to approach one certain common thing. It’s interesting that they celebrate Day of the Dead very early too. 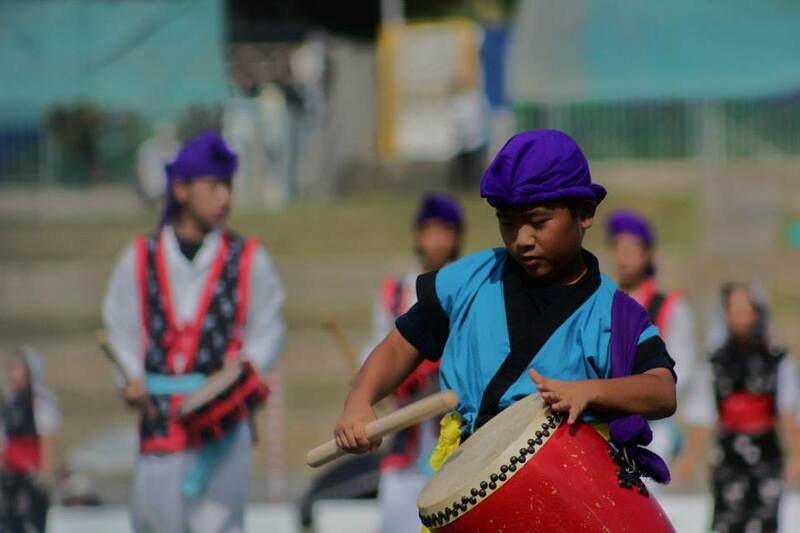 great shots, really colourful and I love taiko drumming! Yes to the jump shots! Those are really something to crow about! I like the tone and pomp of the Eisa Festival, Rommel. 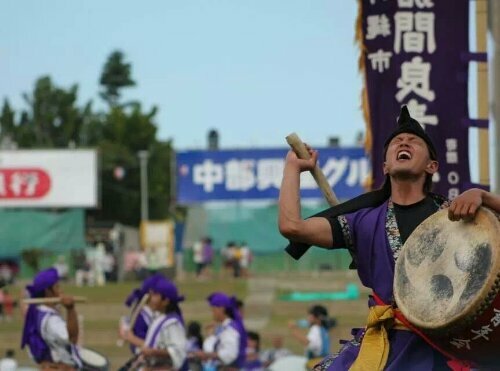 I haven’t heard of it before, and I love learning how other cultures celebrate their ancestry and bidding goodbye to summer is a really wonderful use of pageantry! I am eager to go over and spend some time in your events section! You have been busy! I actually missed the actual Day of the Dead. I’m so glad I didn’t miss this one. It’s weird that they celebrate it in a lively way given it means saying goodbye to the ancestors. 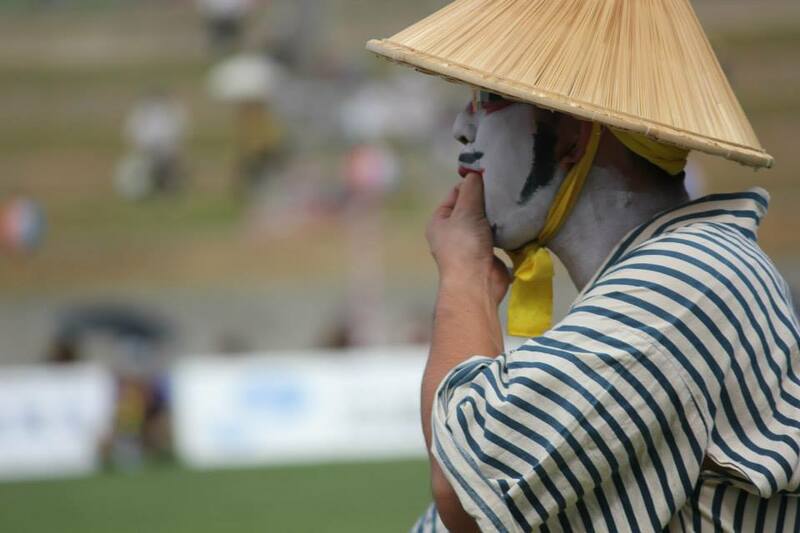 Really cool to differentiate cultures between each other. I have been dreaming of catching any Asian festival for so long, and I’m so glad I finally get to witness one. The closest one I had is the Chinese New Year, but it was LA. I wanted this. It’s a dream come true for me, and I’m thankful for it. I cannot believe summer is about over. The fall colors should be changing here in Colorado soon. Those are some great shots you captured. I agree, I like those jump shots. Can you imagine holding on to that drum, jump, then having to stay in sync with the beat, the music and the choreography! Really smething to applaud to. You mean like the battery commercial with the rabbit and the drum. Bwahahaha 😀 Nice to see yah again poppy. I know right. They’re really into it. You can see it through their veins. Screaming on top of his lungs, he looks so free/d. I love the expressions you have captured on the faces of many of the drummers. We loved to experience local festivals when we traveled throughout Mexico. Fiestas, I can easily imagine Mexican celebrations….. Hmmm … Good thoughts. The title scared me. The content made me smile. And the acknowledge made me feel so recognized. Glad to have met you Gilly. You have all this new material now that you are in Japan. But darn I’m going to LA and wanted to meet you for coffee! Shoot! I so would be there if only. Oh well, have fun in LA! And take really, rsally good care …. really. 🙂 Just kidding, you’ll be a’ight. Oh by the way, I want to post about California while I’m here, but I’ve been very busy as well. I just try to play catch up whenever I can. I love that shot too. I wanted to crop it. I wanted to orientate it to make it straight. I decided not to and thought it is perfect just fine. Great photos! You’ve captured the movement and spirit wonderfully! Thanks. Hope all is well to your end. Ahihihi … No probs at all. It always happens for bloggers. I was away for 5 months actually. 😀 Well thanks for checking in. Just don’t be shy to say hi. 😀 Happy blogging!